With public opinion polls showing opposition to the death penalty at its highest level in twenty years, this timely book by two of America’s most important civil rights leaders and the Nation’s criminal justice reporter makes a passionate and persuasive case against capital punishment. Combining a powerful moral argument with recent, overwhelming evidence of systematic legal error and widespread racial bias in death penalty cases, Legal Lynching directly attacks the basic claims of those—including our new president—who continue to insist on execution as a punitive solution for an increasing number of crimes. With the abolition of the death penalty in South Africa, the United States has become the last industrialized democracy to persist in state-sponsored execution. 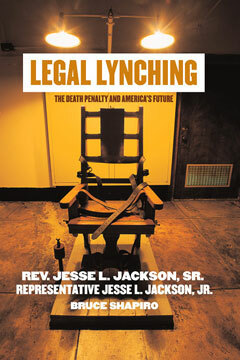 Grounded in stories of those who were unjustly convicted and left to languish on death row, Legal Lynching is a moving, human book by America’s leading death penalty abolitionists. Reverend Jesse L. Jackson Sr. ran for president of the United States in 1984 and 1988. He is the founder and president of the Rainbow PUSH Coalition.